WoW. It was a great evening. Very unexpected turn out..approx 30 people showed up. It was quite overwhelming. It definitely goes on my chart as one of the most humbling experiences. I think about 21 shared their stories and everyone was quite polite and listened. I agree with Igoo's comment about being more interactive and faster pace. But this first one was just me putting feelers out there and honestly testing to see if I could even do it. I really do want to get know everyone better. The stories were great! Next week's topic should allow for smaller groups to interact on a closer level with more real-time discussion as opposed to story macros. This was the get-to-know-the-group meeting. Next week we can start engaging. My idea for next Thursday is to have a THINK TANK format in which we brainstorm to come up with idea for the next evolution of MMORPGs. 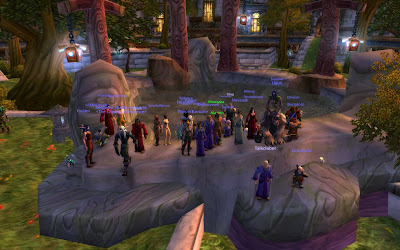 People will be split into groups to take on a certain aspect of the MMORPG and at the end of the night, we'll see what we have collectively come up with. A lot of people mentioned Vent and creating a guild. Guild: I had initially wanted to create a guild to do the event but had major second thoughts on it. The idea of MetaTalk is for people with similar thinking to be able to share experiences and ideas with one another. Its goal isn't about leveling, raiding, PvP, or any real game mechanics. The major con to forming a guild is that it might encourage people to level their characters on the server which I am not opposed to at all, but I am in no way capable of leading a "real in-game" guild on another server. My heart and responsiblity still belong to JAE and my core four. :) And I'd feel terrible if people thougth I was abandoning the principles of MetaTalk. My hope is that people do make friends and acquaintances from MetaTalk and perhaps some will go off to form a guild or maybe even level with each other in the future. I think that would be awesome. For now though, my hope is to keep game mechanics out of the MetaTalk agenda so I can pick all of your brains! Vent: Oye. I'd love to be able to chat with everyone and have everyone chat freely so we can alleviate all the type type typing! But I'm just not equipped to handle managing a voice over meeting at this time. First, my shyness would come off as aloofness and I'd probably not do so well regulating via voice. But I belive that as I get to know everyone better and everyone else gets to know each other better, it could be very possible in the future. In fact, I'm sure of it. Thanks to everyone who came out!! You guys are amazing. Id totally love to attend but i play on EU servers and to attend I would need to buy another copy of wow and keep another subscription up. Not something I can really afford atm. Do you think if there is a vent for it, people that can't attend could join in that way?